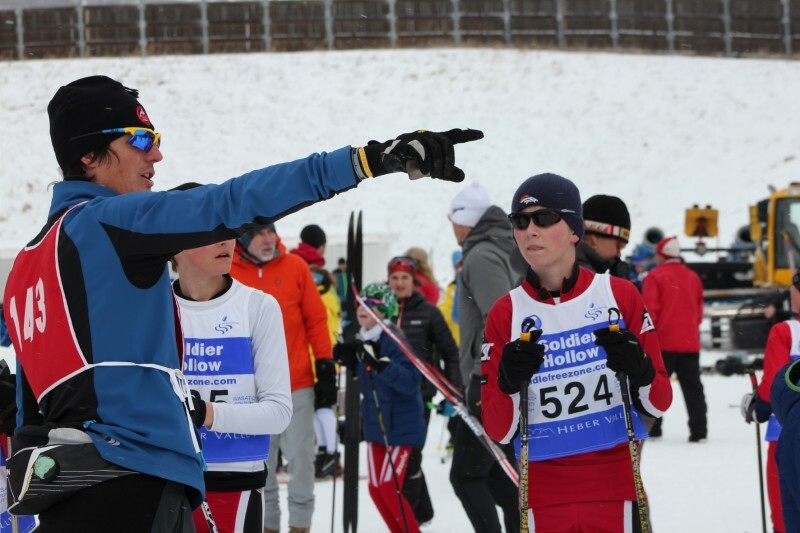 Coach Bryan gives instruction and race strategy before the U14 race at Soldier Hollow (2002 Olympic Venue). The Devo Team Program is a bridge between the Base Camp and Competition Team Programs. Although the emphasis of this program will be on skill development and fun, Devo athletes will work with coaches to learn how to set and achieve process goals. At practice, athletes will start to challenge themselves to make improvements as ski racers, teammates, and people. Devo Team athletes will progress towards mastering their ABC’s (agility, balance and coordination), learn ski specific technique skills, and improve body awareness. In addition, Devo athletes will be introduced to endurance, stamina, speed and dryland training. Athletes will learn some race strategy and pacing skills along with how to maintain and care for their own equipment. All athletes under the age of 12 must travel and lodge with a parent on overnight trips.